Paul Dosh, a native Minnesotan, is an Associate Professor of Political Science and Latin American Studies at Macalester College. He holds a Ph.D. in Political Science from the University of California, Berkeley, and his articles appear in Latin American Politics & Society, Latin American Perspectives, Journal of Latin American Studies, and the Political Science Educator. His work on this project was supported by a Fulbright-Hays Doctoral Dissertation Research Abroad fellowship. James Lerager is founder and director of the Documentary Photography & Research Project. He holds a Master's Degree from the Goldman School of Public Policy, University of California, Berkeley, is the author of the books "In The Shadow Of The Cloud" and the forthcoming "Nuclear History - Nuclear Destiny" and "Mexico: Portraits of Complexity." James has had 35 solo photography exhibitions. He was a Fulbright Senior Scholar in Medellín, Colombia in 2004 - 2005. This project also benefited from the indispensable contributions of our field research team, César Flores, Andrea Galdames, and Jesús Valencia. The text was translated into Spanish by César Flores. From Tijuana to Buenos Aires, the cities of Latin America are teeming with people. About 75% of the region’s populace now lives in urban areas, and in many cities well over half the population lives in substandard “self-help” housing that is either built illegally or lacks electricity and running water, or both. This project examines several such communities founded in the 1990s by illegal land invasions in the capital cities of Lima, Peru, and Quito, Ecuador. September 23, 1995. The Ecuadorian sun is rising over the capital, Quito, a city whose mayor, Jamil Mahuad, has shown a willingless to use violence against anyone who challenges the social order. Imagine Mahuad’s surprise when he learns that 300 poor families have materialized on some of the downtown district’s most valuable undeveloped land: a grassy hill named Itchimbía, which has become a dumping ground for central Quito. The settlers declare their intention to build homes and become custodians of the land, transforming it from a dump into an ecological park. But Mayor Mahuad has plans to build a five-star hotel on this real estate, so he dispatches riot police to eject the settlers. The police arrive expecting armed resistance, but find only men and women with garbage bags, cleaning. When asked to leave, the settlers passively comply. Mission accomplished, the puzzled officers head for home, and so the settlers of Itchimbia come right back, returning to their cleaning! But by the next morning, 3,000 more settlers have spontaneously arrived, and a huge march for recognition parades through downtown. The mayor stonewalls them, but their large numbers force him to move cautiously. But although the surprise arrival of 3,000 more people helps keep the police from returning, their arrival presents a dilemma for the original group of settlers. If everyone stays, there will be no land left for the park, which will make their unique “eco-park” proposal irrelevant. They will be “just another land invasion.” Through difficult negotiation, however, the original group convinces the newcomers to leave, and the original settlers begin to build their illegal neighborhood. Three months later, the police try to surprise the settlers with another raid. But when they arrive, they find the settlers chained to their makeshift homes, surrounded by international journalists, cameras clicking. The police resolve to try again later, but all the while, Itchimbía steadily develops its urban infrastructure through stolen electricity and clandestine water pipes. The creativity of the Itchimbía settlers is exceptional, but in Latin America, the phenomenon of unarmed poor people braving violent repression to carve out a shantyhome is commonplace. WHAT IS A LAND INVASION? A land invasion takes months of secret meetings to prepare. Once the settlers arrive, typically at night, and often when there is some kind of political distraction going on, they set up makeshift homes and enter a state of perpetual political struggle. They must find cheap or free construction materials; they build everything themselves. Initial invasions typically involve 100-500 people, but can be much larger. In 2002, 5,000 people participated in one of the largest invasions in Lima in years. Throughout the last half century, tens of millions of poor Latin Americans have participated in this kind of illegal seizure of land. Such invasions are followed by five, 10, 20 or more years of struggle during which each community strives to build a functioning neighborhood with reliable services. Some settlements eventually become attractive working-class neighborhoods -- looking at them today you would never guess how they began. But although land invasion organizations can deliver significant material gains, this is not “upward mobility.” These settlers remain poor, and often jobless, despite having a home. Furthermore, many invasion organizations hang on to the land, but still fail overall. Despite years of struggle, they cannot deliver the needed services for a decent quality of life. 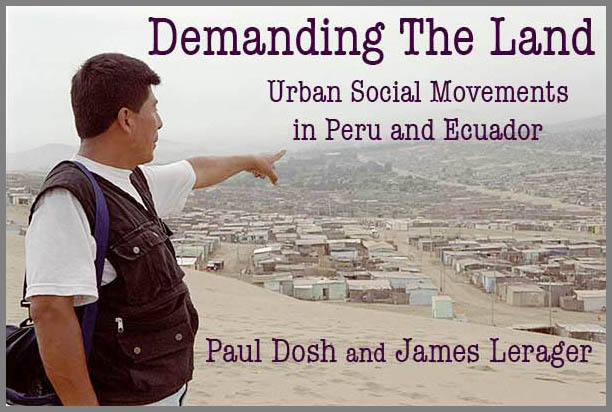 Many had anticipated the trend of land invasions would decline as metropolitan areas like Lima and Quito simply ran out of available land to seize, but in the wake of the 1982 Debt Crisis, and the onset of neoliberal economic reforms, increasing economic vulnerability and an expanding informal labor sector sustained this kind of mobilization. Yet several things changed. Just as decreased availability of reasonably convenient land led to seizures of distant and barely inhabitable terrain, so too did old forms of invasion organizations evolve into new organizational types. The local political context also changed. As in many Latin American countries, the 1980s witnessed the introduction of municipal elections in both Peru and Ecuador. While struggles between democracy and authoritarianism continued to dominate the national stage, empowerment of municipal government took root and slowly grew, gradually transforming the local context for invasion organizations. At both national and local levels, party identification became less important as party systems either faded in importance or collapsed outright, as in Peru. While some things changed, others have remained the same. Although the organizational strategies of settlers underwent major changes, their fundamental objectives remained strikingly similar: electricity, water, sewers, and legal title to illegally acquired land. Yet despite this seeming continuity in the services sought by settlers, subtle changes altered even this otherwise predictable part of the shantytown landscape. With the implementation of neoliberal reforms, Peru, Ecuador, and other nations increasingly privatized urban service monopolies, dramatically altering the strategic menu available to settlers. This study focuses on settlements founded by land invasions in several poor districts of Lima and Quito. Despite similarities between invasion neighborhoods in Lima and Quito, examination of the broader political and geographic contexts reveals several surprising differences. For example, in Lima invasions have become routine and institutionalized, while in Quito they are considered aberrations. Controlling for population, Lima’s invasion rate in the 1990s was double to triple that of Quito. In Lima, we often see vibrant neighborhood-level democracy, but in Quito, local bosses dominate. In Peru, pro-settler legislation enacted by the leftist government of General Juan Velasco (1968-75) makes public lands ripe targets for invasion organizations. Yet their Ecuadorian counterparts more often attempt to occupy private land, in part because of an entrepreneurial city hall in Quito that vigorously defends its own property, while leaving landowners who lack political connections to fend for themselves. Grounded in this introduction, please click on the above links to Chapters 1-10. You can either view the chapters in order or skip ahead to chapters that grab your attention. Thanks for your interest! Planning a trip to Peru? Be sure to set aside a day in Lima to visit Villa El Salvador. Human rights activist and invasion settlement co-founder Jesús Valencia (pictured in the photo at the top of this page) regularly hosts visitors from abroad and takes them on a tour of Villa El Salvador, including the Industrial Park, a Comedor Popular kitchen, and the invasion communities of La Encantada, Paraíso, and Villa Mar. 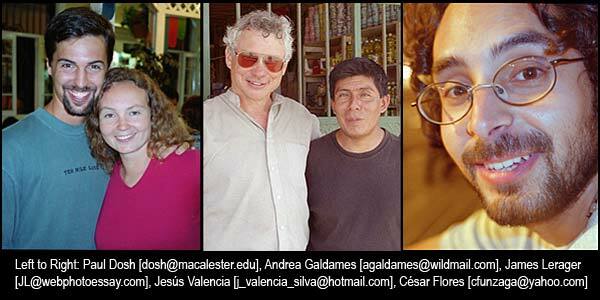 For details, contact Jesús Valencia directly (j_valencia_silva@hotmail.com) or write to Paul Dosh (dosh@macalester.edu).